If you think Hagelin’s lesson titles are a mouth-full of B.S., steer clear of the lesson itself. An esteemed — alleged — master of quantum physics, Dr. Hagelin inaccurately expresses the acoustic dynamics of loudspeakers. A loudspeaker, at 1 W/Meter reference, typically harbors a sensitivity in the range of 85db to 110db. Adding a second loudspeaker we would expect but a 3db gain. This is the result when we double the loudspeakers, a 3db gain in sound pressure level (SPL). But to see that same 3db gain a second time we must essentially double our loudspeaker total, increasing it to a total of four(4) loudspeakers to yield a total 6db gain in SPL. In other words, to yield a wave with 3 times the amplitude of a single loudspeaker, we need four(4) loudspeakers rather than the three(3) suggested by Hagelin’s acoustic blunder pictured below. Pictured above, page nine(9) of “Unified Field Based Education–Education for Enlightenment: Education Based on Total Knowledge for the Total Development of Mind, Body, Behavior, and Society” by Dr. John Hagelin. 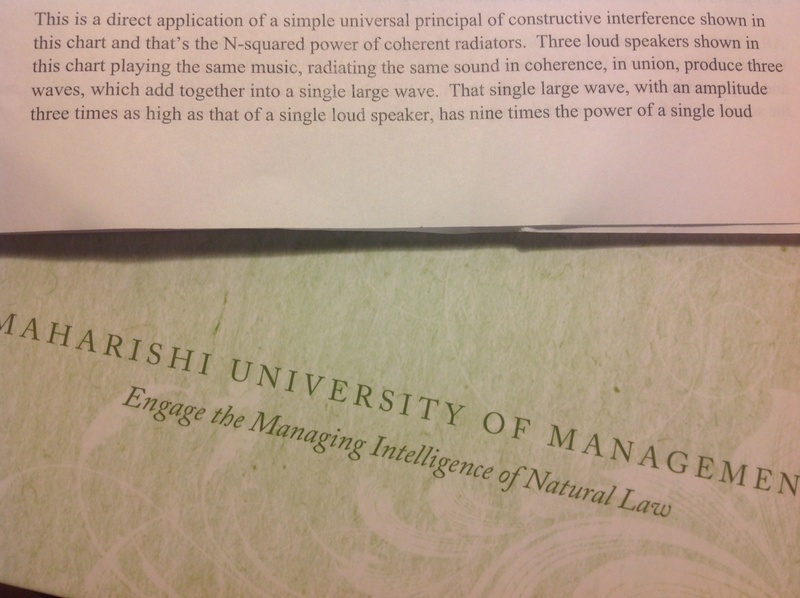 In his argument, Hagelin further states that the combined power of the wave produced by his three(3) loudspeakers is nine(9) times the power (P) of a single loudspeaker, when in fact it is simply three times the power of a single loudspeaker. Needless to say, one could use the same logic I’ve described in doubling speakers for a 3 db gain, and apply it to power. For example, we can double the power(P) applied to one(1) loudspeaker and yield that same 3db gain. Then we can double it again (four times the power) to see a 6db gain. This is the logarithmic characteristic inherent in most common loudspeaker calculations. Whether we increase applied power to a single loudspeaker, or increase the number of loudspeakers powered, we see the same result in respect to sound pressure level. This is because sound pressure level is a function of air (the medium) movement resulting from the excursion of a loudspeaker’s cone. Therefore, we can double the excursion of one loudspeaker’s cone to move that air, or we can double the number of loudspeakers moving air. On both counts — of the combined power of the wave produced by three loudspeakers, and the combined amplitude of the wave produced by three loudspeakers — Hagelin’s mastery of physics fails. 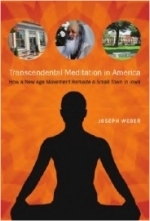 In a swoop of unified genius, Hagelin parallels this fictitious acoustic behavior to that of Transcendental Meditation practiced by a group. This error isn’t too alarming, with one exception: Transcendental Meditation is essentially mantra meditation, which is rooted in sound. Mantra is a sound in the mind on a subtle level; a mentally audible “voice” connected to the subtle sense of hearing. Therefore the error is two-fold, erroneous concept and application. 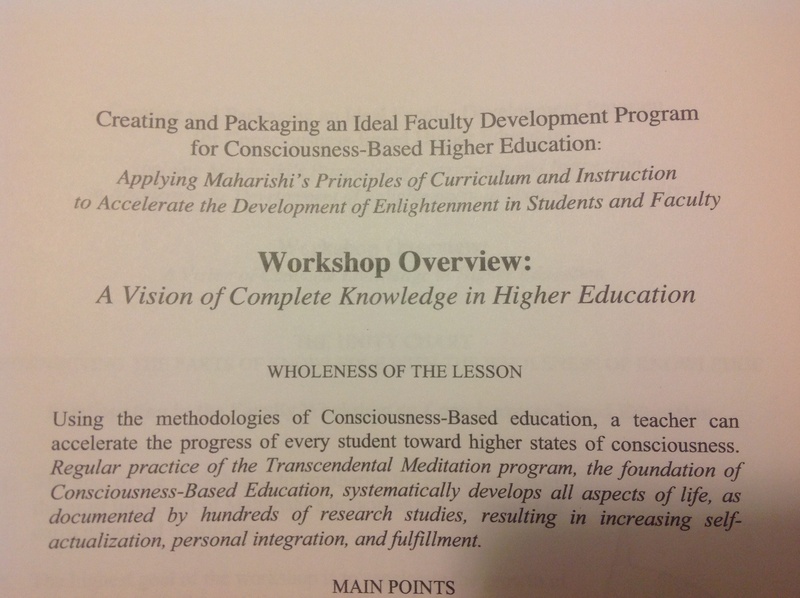 Creating and Packaging an Ideal Faculty Development Program for Consciousness-Based Higher Education. No surprise, the source of this hay is the latest Maharishi University of Management workshop to foster the development of its faculty. For this reason it seems perhaps much of the university’s widespread instructional failure is ultimately systemic. I refer to this as “Trickle-Down B.S.” as administrators bestow arguments from ignorance on its faculty, its students the benefactors of thrice-baked knowledge rooted in faulty syllogisms as articulated by Hagelin in his loudspeaker metaphor — Maharishi Effect in tow.